Did you try to search the word – Digital Marketing on Twitter?— Do It Now, and you’ll get millions of results. There are a lot of people discussing about it. But the question is how do you know who to listen to? 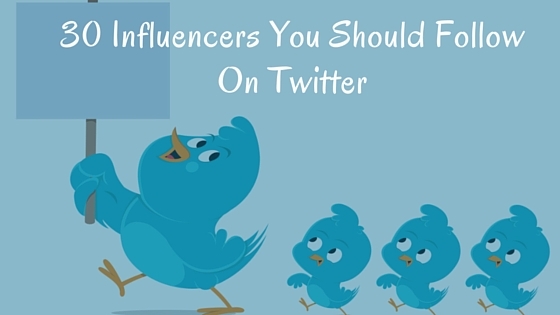 You just need to be following the right people if you want to get interesting & useful information constantly. In Alphabetic order, here are 30 digital marketing influencers to follow on Twitter – Follow these Experts and enjoy their expertise and advice! Bio: International SEO Consultant & Keynote Speaker. @Orainti Founder. @sengineland Columnist. @Moz & @stateofdigital Blogger. Digital nomad. Building @Remotersnet. Bio: Founding Editor, @MarketingLand & @SEngineLand, covering Google, Facebook, Twitter, SEO, SEM & all things digital marketing, search marketing and search. Bio: Mantra: I empower people. Chief evangelist of @Canva. Author of thirteen books. Former chief evangelist of Apple. Bio: Started two SaaS companies, @CrazyEgg and KISSmetrics with @NeilPatel. One is self-funded & the other is venture backed. I enjoy helping others think. Bio: #1 Content Marketing Influencer,Social Media Marketing Strategist & Speaker,Forbes Top 10 Social Media Influencer,#1 Global Business Blog. Bio: Content Crafter at @buffer. Tweeting about my writing process and my favorite Internet things. Live simply, give generously. Bio: Social Selling Strategist, First Lady of Periscope, Best Selling Author, Speaker, Forbes Top 10 SM Influencer. Loves God, family & hockey! Bio: Founder @WordStream. Top Columnist @Inc Magazine. ❤️ Entrepreneurship, Start-Ups, Adwords, Facebook advertising. Bio: B2B demand generation, pipeline management, sales enablement, content strategy, inside sales effectiveness, marketing technology, driving revenue & results. Bio: Entrepreneur, investor & influencer. Columnist for Forbes, Inc, Entrepreneur, Huffington Post & more. Founded KISSmetrics, Crazy Egg, QuickSprout & Hellobar. Bio: The founder of Appsumo and OKDork, Kagan is constantly sharing great pieces of content and bits of information via his Twitter feed. Bio: World’s #1 Expert on Sales Growth through 80/20 Leverage. Bestselling Author on Google & Facebook ads. Bio: Moz founder, author, blogger, husband to @everywhereist, tiny Techstars investor, & feminist. I tweet 30-40X/week about marketing, SEO, technology, & startups. Bio: Author, blogger, a lifetime of projects. This is a retweet of my blog. Bio: Digital marketing brand strategist, information junkie with a penchant for quick wit. Partial to Milk Duds. And #beer. If you have any suggestions to add to this list, please mention in comment section below.